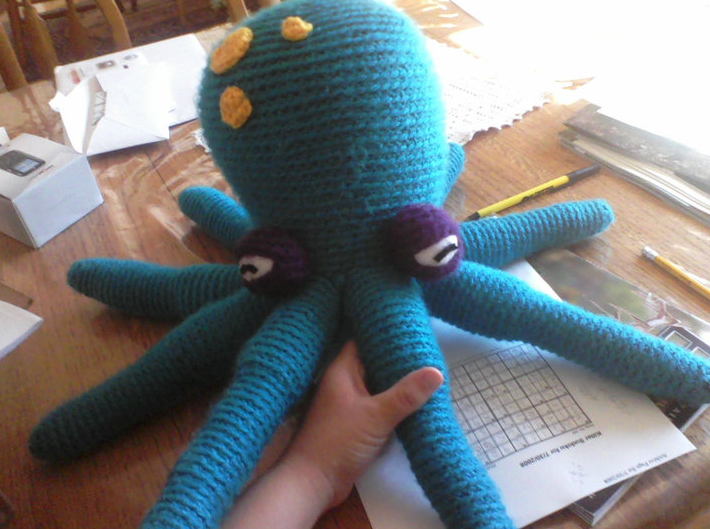 This is my amigurumi octopus whom Aaron, once again cleverly named LiverSpot Lloyd. 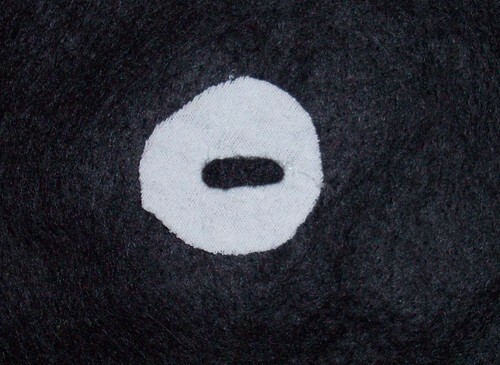 I’ve chosen to keep track of my pattern to share with you all. 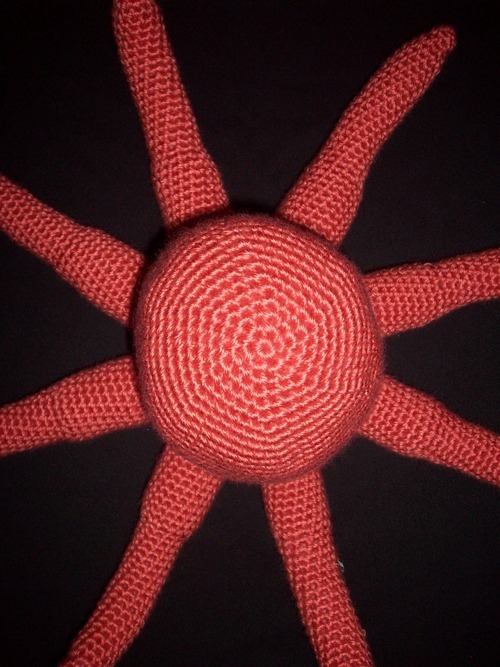 So please enjoy my free amigurumi octopus pattern. Both my Peachy-Pink and Maroon yarns are Caron simply soft, which I find has a smaller outcome than yarns like “RedHeart” and “I love this Yarn” from Hobby Lobby, so if you are using those yarns, you can expect something slightly larger than my Octopus which is roughly 17 inches (tentacle to tentacle) and 7 inches tall. F/O leaving long tail to stitch to Arms. Pardon my ugly nail polish. At this point you will notice that there is a gap in the eye where you made the 6 chains. This is where you place the eye whites. You can stitch them in or use a glue gun. Either way is fine, as long as you stitch them in from inside of the Eye Socket. F/O leave tail to stitch to head. After I stitched on two more arms, I stuffed the octopus a little more, but not too much, or else it would make a little bubble on the bottom. Stuff it firmly enough not to cave in, but not too much. 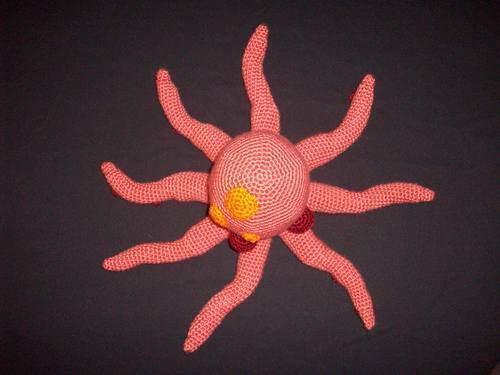 I hope you enjoyed this Amigurumi Octopus pattern and please share your finished products with me if you ever use it by emailing me at robotrish@yahoo.com, and please don’t hesitate to comment or make any corrections. No pattern is perfect. ooo awesome!! ^_^ I just posted your pic. Very nicely done Abby… btw, is that a sudoku puzzle I see? 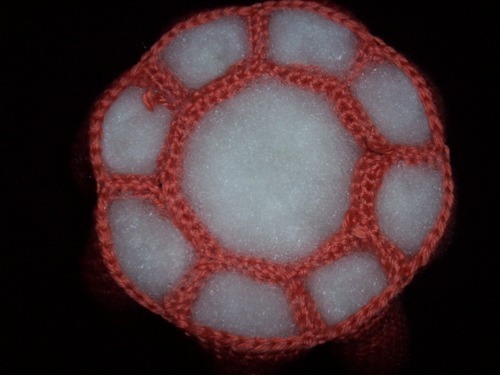 I’m new to crochet, and I’m trying to understand…is the number after each round the number of stitches you should have total, or the amount of stitches you are supposed to have in that round? The number in parentheses represents the number of stitches you should have after completeing that round. 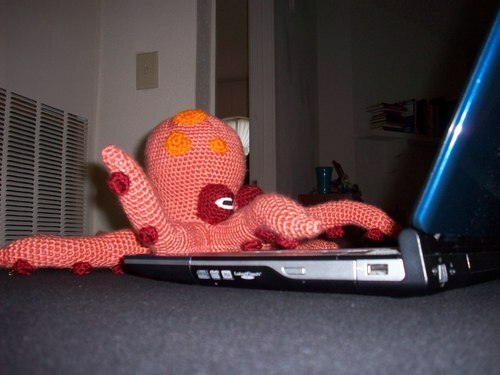 This octopus is brilliant! What a nice thing to share with us. Thank you. I am semi-new to crochet. 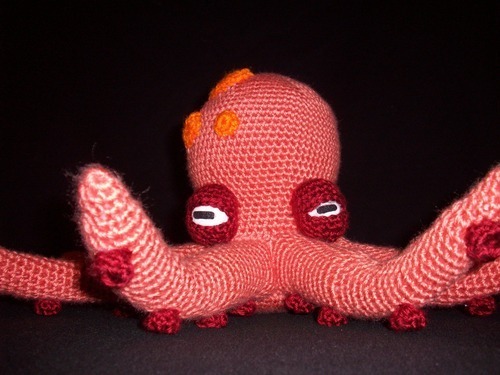 I have made the typical afghans, shawls etc….but I just recently made a bumble bee and I am currently making a turtle, this octopus is my next project. I find that making these “creatures” really makes me smile as it is so cool to watch the project form. 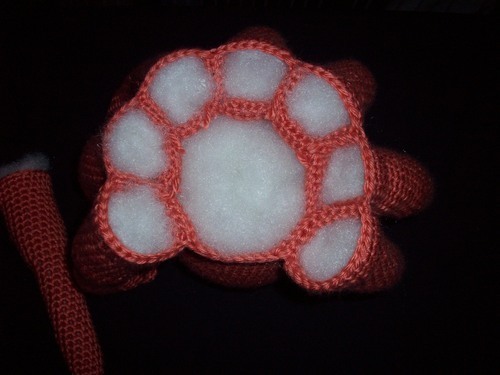 Rounding on the bottom of this turtle I am doing is very confusing to me, but after seeing this I am going to try to follow your pictures to create it. 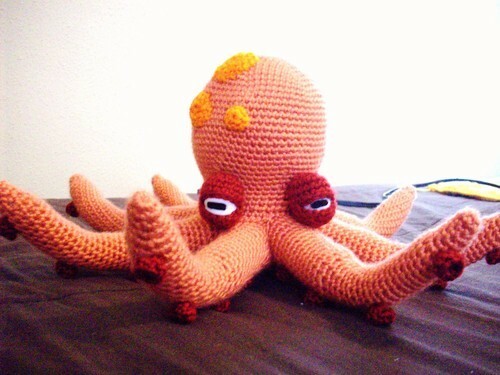 I absolutely love this octopus pattern, and I was wondering if you could send me the pdf file of it also. You do such great work. I love all of your patterns. Do you have a facebook page? I wish I could see a larger picture cuz the colors look awesome!! I’m glad your boyfriend liked it, nice work! 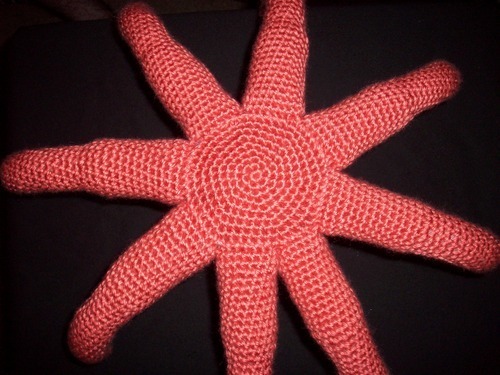 I just started to crochet because of this pattern. I just finished up round 8 on the head. It is coming along fairly well for my first time but out of curiosity, at that stage should it be drooping down to form the head? As of now it is a disc and I am thinking my stitched are too tight. I will post a picture when I’m done. Thank you! 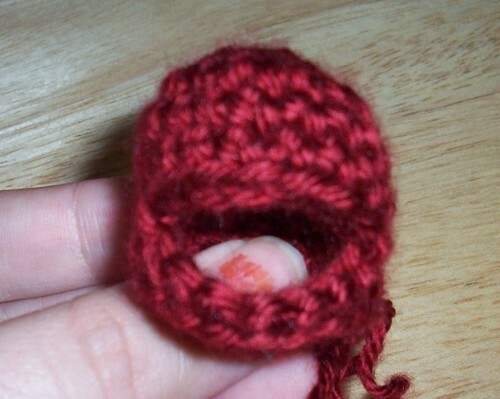 don’t worry, the head is not supposed to begin forming its cup shape until around row 11 or 12. I look forward to the picture! I am making this and having a problem with curling. Is that common with this because of the SC in the single stitch? Thank you so much for this pattern! I’m from Finland but instructions are so simple so I’m gonna try to make this for my sisters baby. I’m sure he will love it!!! I’ll send some pics after I’m done. Love it! This is my first attempt to make anything other than a beanie. Just one more arm, one eye, suction cups and liver spots to go! 😀 I’ll be sure to post a pic of my final piece. Thanx for the pattern…I’m having a lot of fun with this. THANK YOU SO MUCH! I’ve been looking for THIS pattern all over the place! I saw it on Google Images and saved it to my computer a few weeks ago because I just thought it was the cutest thing ever. Have you ever been on Ravlry? You should definitely make an account and put this guy on there because this pattern is just perfection. Also, a small note (and something I wanted to mention) – something I found that made it easier to get the suction cups on and will keep them from coming off. 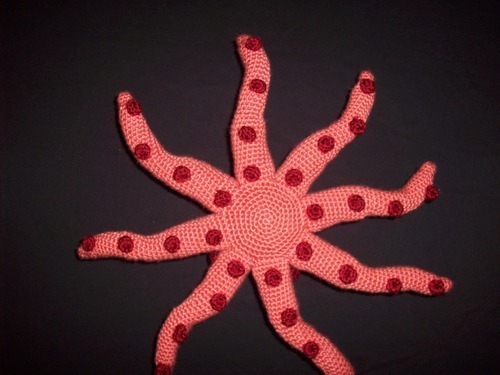 I made the suction cups before I even made the arms, and as I was crocheting the arms at what I felt were appropriate intervals I slipped the hook through the post of a stitch on the back of the suction cup before grabbing the yarn to pull through so it’s literally crocheted onto the outside of the tentacle – you can’t see it from the outside of the suction cup, they literally will *not* come off without being completely unraveled, and it’s really quick. 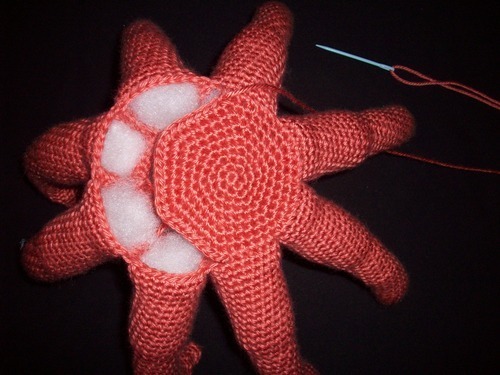 You just have to pay attention to where the other suction cups are when you’re crocheting each arm. Thought I’d mention it for any of your readers who were interested! I just started working on this guy and I was wondering, do you end each round with a slipstich and ch1 or just keep going in continuous rounds?